Photo measuring 2.75 x 4 inches. 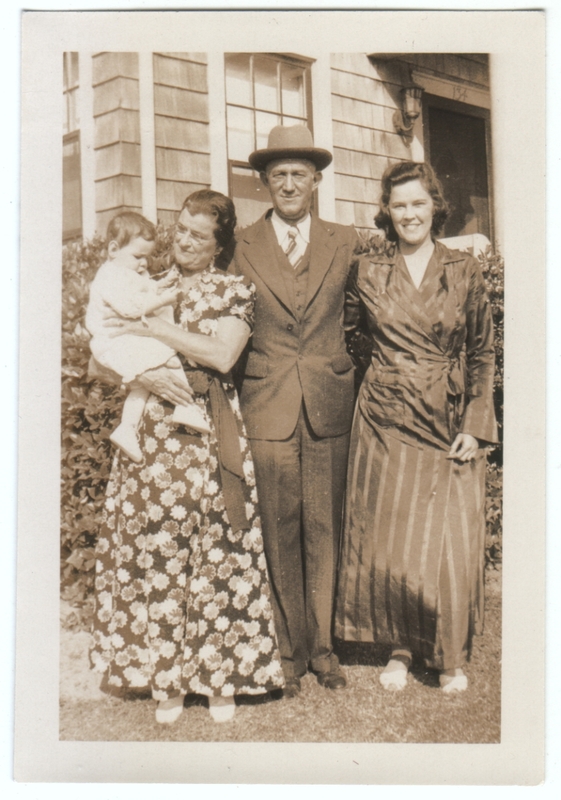 I’m assuming this is a young woman with her parents and her baby, but without any identifying information I can’t be completely certain. I think the photo’s sepia tone enhances the overall warmth of the image, but I do wonder what those dresses look like in color. The young girl looks like she’s wearing a robe? I wondered the same thing. I thought perhaps it was just a dress style I wasn’t familiar with, since I found it strange that a woman in those days would be wandering around her front yard in her housecoat. But I could easily be wrong. I think those might be very nice bathrobes, at least I’m pretty sure the young woman’s is. I bow to the knowledge of my readers. You and adaisygarden both think this, and I’m happy to accept it. I’d still like to see what colors they are. I knew I should have hit “refresh” before commenting! Well, I agree with adaisygarden.